The Ryerson Urban Farm, at Ryerson University, is a unique campus green space just minutes away from one of the city’s busiest intersections at Yonge and Dundas Sts. A quarter-acre rooftop farm, on the Andrew and Valerie Pringle Environmental Green Roof atop the George Vari Engineering and Computing Centre, produces 10,000 pounds of “ecologically-grown” food each year — including honey from their three rooftop beehives. Produce is sold and also distributed to those in need through the Good Food Centre at Ryerson. A second rooftop farm is scheduled to open on the Daphne Cockwell Health Sciences Complex this year, and will be the first purpose-built green roof for food production under the City of Toronto Green Roof Bylaw. 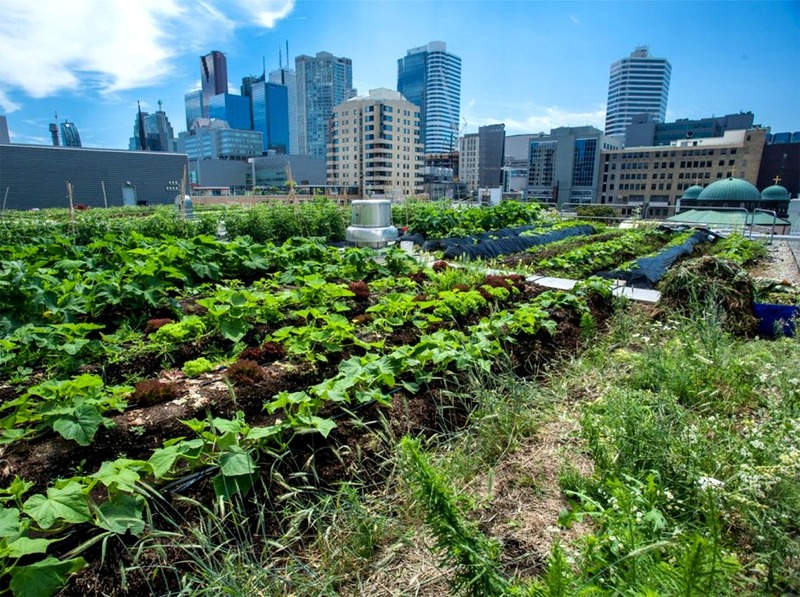 Tours of the Ryerson Urban Farm will open to the public once construction to make the roof more accessible is completed. Originally built in 2004, this green roof was converted into an edible garden in 2013 by Ryerson’s student-initiated garden group, Ryerson Urban Farm (RUF and formerly Rye’s Homegrown). With the help of students, staff and faculty, Ryerson Urban Farm has created an urban farm with more than 30 crops and over 100 varieties. The green roof was built by Terry McGlade of Gardens in the Sky (later Flynn Canada) as part of the original design/infrastructure of the building to catch stormwater runoff, reduce the urban heat island effect and reduce energy consumption by cooling the building during the summer and insulating it during the winter. It was initially planted as an ornamental garden with daylilies, (Hemerocallis ‘Catherine woodbury’) and from the beginning was equipped with a suite of hydrological and climatological sensors for research purposes. This roof received minimal maintenance for over eight years, with just woody species being removed to prevent membrane damage, and for many years there was no irrigation system installed. RUF aims to build capacity for urban agriculture through production, education and demonstration. They draw upon principles of ecological garden design to create gardens that are beautiful, productive and resilient. This involves incorporating local resources into the design, focusing on soil building strategies and using low-impact techniques. The results are gardens that are abundant, nourishing and lasting. Hurry, Grey to Green Conference Registration Closes Soon, this Sunday May 29!